I’m kind of surprised I haven’t done a Pac 12 powerhouse like California yet, but hey here we go. This week I’m counting down Phil Steele’s Pre-Season Top 50 for 2001 and it’s number 48, the California Golden Bears. For some reason I’ve been avoiding Oski because he shows up in the weird mascot lists and he doesn’t look that weird to me. At any rate, I have him in my sights and will learn many things, including how a mascot chugs a beer. Oh boy, I’m already regretting that I waited this long. The University of California, Berkeley found its way to life in 1868 thanks to a land grab and expansion effort. The university likes to tout a ton of Olympic medal winners, like UCLA and USC do. The football had similar success but kind of dipped in the middle of their history. They started life as a rugby knockoff but made it official in 1886. Their early life found much success with national championships coming four years in a row from 1920-1923 and then another one in 1937. After that, they kinda fell off, with a couple of Rose Bowl appearances, with the last being in 1959. It was a drought for about 40 years, except with a Garden State Bowl showing in 1979. Since then the Golden Bears make a semi regular appearance in bowls. So how did California become the Golden Bears? Well, in 1895 the track and field team felt that they were so great that they had to tour the country and take on other teams. Regent Arthur Rodgers commissioned a banner with the school colors and a big grizzly bear, the state animal. They ended up going 5-8 so they backed up their winning talk. That trek inspired Professor Charles Mills Gayley to write ‘The Golden Bear’ song and the tradition stuck ever since. 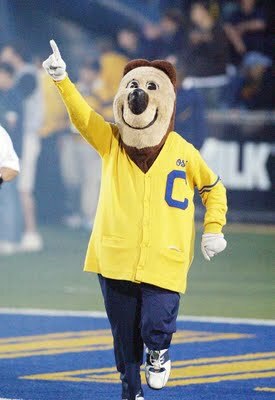 California started out their mascot tradition like many other schools and dumped a live mascot on the field to inspire fear for the other team. And much like those schools, the cost and risk of having a live animal on the field was too much for them to handle and decided to go all costume. 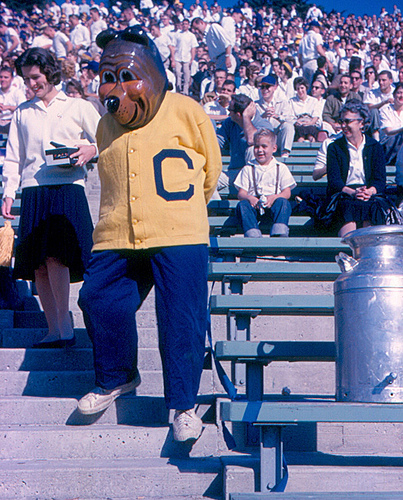 That costume made his debut for the 1941 football season. Oski’s his name and that name came from the Golden Bears popular yell, ‘Oski Wow Wow.’ Every time that the school needs a new mascot under the furry head, the Oski Committee makes that decision. So how does Oski stack as a mascot? Well he is kinda weird looking. He looks like an old 1940s grandfather for some reason. The cardigan, the pot belly, and the droopy face hints at that big time. Now that I think of it, Oski reminds me of Mr. Wilson of Dennis the Menace fame. Much like Mr. Wilson’s addiction to ‘nerve medicine,’ Oski medicates using tube going through his eye. Okay, that’s cool. Everything else about him screams lame, but at least we know the old codger can still party. While he does seem old fashioned, Oski keeps up to date with the kids and stands his ground chugging wise. No, he more thank likely will not win any major mascot contests anytime, but he certainly won’t rank as a fuddy duddy. 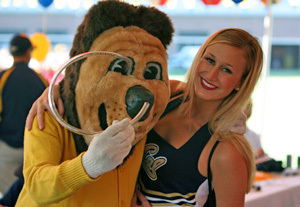 Chances are the selection committee for the mascot contest does a Facebook check on this guy and spies all of the chugging pics Oski has online. That’s all they need to say no. But I say yes and you should too.